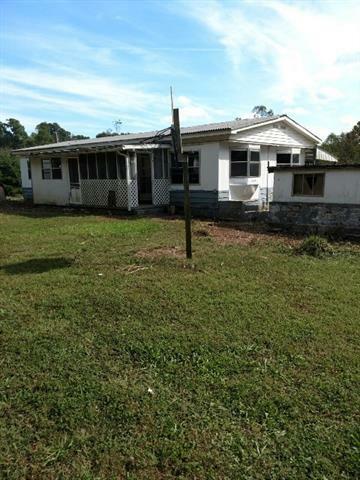 Double wide mobile home with .8 acres of land. Homes has two additional rooms that can be used as bedrooms, they do not have closets. Screened in front porch with detached garage and two small buildings in the back. Large back porch that used to set above an above ground pool. Seller and agent make no representation as to condition of property expressed of implied, buyer and/or agent to confirm all stats. Home is in need of maintenance and repairs. Property sold as is. All offers submitted must have proof of funds and Pre- Approval Letter. Any licensed agent purchasing a REO property from seller as a "principal" will not receive the 'selling portion' of the sales commission. Property is lender owned, U.S. Bank is making no representations or warranties. *HVAC system along with master bath tub were removed from the property. Property currently has no heat source without the heat pump. Sold by Weichert, Realtors - Team Metro. Offered by Kelley Realty. Copyright 2019 Carolina Multiple Listing Services. All rights reserved.